I own a Pocket PC since a few months. It's a nice peace of hardware although I didn't use it much. There wasn't much practical use for it. Now I have decided to write my own Time Registration and maybe my own Car Mileage Administration application. In both Smart Device Applications I have to enter a Time regullary. Microsoft didn't supply me with a good control for this so I decided to write one. Writing a Smart Device Applications is made easy with the introduction of Visual Studio.NET 2003 and the .NET Compact Framework. 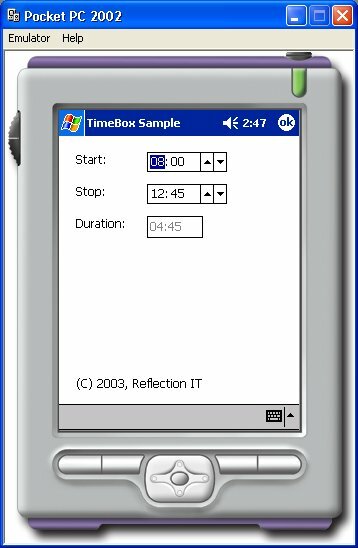 In this article I describe how I have written a TimeBox control for the Pocket PC. It's not much different from a normal Windows Forms control. I plan to use this TimeBox in my application so I have placed it in an separate project. Due to the low memory footprint you also have to create a designer able version of it. This version will have extra design-time only code (methods and attributes). 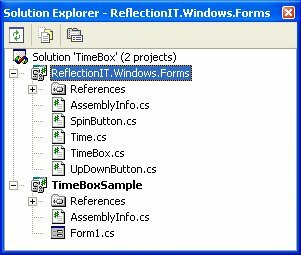 The ReflectionIT.Windows.Forms project consists of 3 controls: UpDownButton, SpinButton and TimeBox. The UpDownButton is used by the SpinButton control to draw a Up and a Down button. The SpinButton is used by the TimeBox to spin the hours and minutes. Once you have compiled your control you need to copy it to specific locations so that Microsoft Visual Studio.NET and the .NET Compact Framework can find it. The runtime version of your control should be copied to the C:\Program Files\Microsoft Visual Studio .NET\CompactFrameworkSDK\v1.0.5000\Windows CE\ directory if you have done the default install. I have created a special batch file (copytowince 2003.cmd) which compiles the controls project and the designer project and copies the DLL's to the correct folders. The Time class is used to store the Hours and Minutes in. It supports arithmetic, comparison and conversion operator overloading. The Time class has a TypeConverter which is used to support designer serialization. The designer version of the control project has a special Conditional Compilation Constant named 'NETCFDESIGNTIME'. This constant is used to add extra code for design-time support. Attributes are added to methods. Extra classes and methods are included for resizing, serialization and type conversion. The output of this project should be copied to the C:\program files\microsoft visual studio .net 2003\compactframeworksdk\v1.0.5000\Windows CE\Designer folder. The TimeBox Sample client project has two TimeBox controls and a disabled TextBox control. 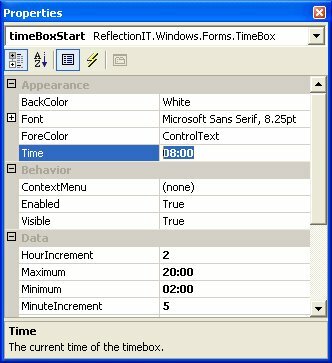 The difference between the two times is displayed in the TextBox using the TimeChanged event of the TimeBoxes. IntelliProg - Design-time functionality for custom controls in Compact Framework and SDE. Writing this TimeBox control was realy a challenge. The documentation of the .NetCF is very limited. I hope that this article and sample code will help you write your own controls for the Pocket PC. I hope I can port these applications to a Smartphone solution as soon as Microsoft will produce a .NET Compact Framework for it. A Pocket PC is just to big to carry around the whole day. Hopefully it works! In Windows XP all wizard dialogs have a nice looking header. This WizardHeader control can be used to add these headers to your wizard forms. The following steps explain how you can use the WizardHeader control in your WinForm projects. Step1 - Download the Zip file and extract it. Download Wizard.zip and extract it to you local harddrive. This version was compiled using the final version of Microsoft .NET Framework SDK. The C# source of the WizardHeader control is included. Create a Windows Application project. Right-click the Toolbox and select 'Customize Toolbox...'Select the '.NET Framework Components' Tab and click the 'Browse' button. Open the 'WizardControlLibary.dll' in the Wizard\WizardControlLibrary\Bin\Release folder. The 'WizardHeader' control is checked and will be visible in the Toolbox. Click OK. The WizardHeader control is an small control. Use it in your wizard forms or study it to learn more about creating .NET controls. I used to program in Visual Basic 6.0. It is a great tool but not perfect. It was lacking some crucial controls. A Splitter control was one of them. Microsoft has added it to the .NET framework (thanks) but forgot to make it easy to use. You must place it on a Form, set some properties for it and then also some (Dock) properties of the other two controls. Then you have to set the order of the controls correctly by using 'Bring to Front' or 'Send to Back'. This article demonstrates the use of a simple AddSplitter() method which simplifies the use of splitters. I will explain how you can create a Form with two Spitters as shown above. Create a Windows Form and a a ListBox and a Panel to it. Add another ListBox and TextBox and place them in the Panel. Do not place any Spliters on the Form, they will be added using the AddSplitter() method. Modify the constructor of the Form. The vertical splitter is added between Listbox1 and the panel. The horizontal splitter is added between ListBox2 and TextBox1. Splitters are great but not easy to use, the AddSplitter() method solves this. This article demonstrates the use of the DualList component in a Microsoft .NET WinForm application. It doesn't explain how the component was written, you can figure that out by examining the C# source code (see download). You don't want to program this in every form which has 2 listboxes and some move or copy buttons. This would lead to lots of (duplicate) code which is very difficult to maintain. A generic (reusable) solution is required. There are three possible solutions: a class, a (composite) control and a component. Within your form you create an instances of this class and initialize it with an 'action' (move or copy and selected or all), 2 listboxes and 1 button. You need an instance for each button on your form. The class handles all events of the controls (e.g. Button.Click, ListBox.DoubleClick) and executes the requested action. The solution works fine but is not user-friendly. You have to do everything from code, you can not use the designer. This composite control would hold the 2 listboxes and 8 buttons. One button for each action in each direction. The user (programmer) can set the properties and handle events easily using the designer. It has the disadvantage that it is not very flexible. The layout of the composite controls will need lot's of special properties which not contribute to the problem description (low cohesion). The component is a "best of both worlds" solution. You can set it's properties using the designer and doesn't need any layout properties because it doesn't contain any controls. The DualList component takes care of all the features mentioned in the problem domain. You can place it on the form as a sort of "invisible control". Next you set its behavior properties: Action, Button, ListBoxFrom and ListBoxTo. Optionally you can set the DoubleClickSupport and EnableDisableSupport properties. The DualList handles all events of the controls (e.g. Button.Click, ListBox.DoubleClick) and executes the requested action. The following steps explain how you can use the DualList component in your WinForm projects. Download DualList.zip and extract it to you local harddrive. This version was compiled using the final version of Microsoft .NET Framework SDK. The C# source of the DualList component is included. Create a form, place 2 listboxes and the required buttons on the form. The example only uses an Add and Remove button. These buttons move the selected items between the listboxes. Add some items to the listboxes. You can off course set the Sorted property of the listboxes to True. Open the 'ReflectionITWinFormComponents.dll' in the DualList\ComponentLibrary\Bin\Debug folder. The 'DualList' is checked and will be visible in the Toolbox. Click OK. Drag two DualList components on your form. The DualList component has 2 events. The BeforeAction event can be used to Cancel the action or to change the moved/copied Item. The AfterAction event can be used to process your changes (e.g. write them to your database, select the moved/copied item). The DualList Component is an easy solution for a difficult feature. It takes care of all logic needed to move and or copy items from one ListBox to another. It demonstrates the possibilities of .NET components. A very new, powerful feature of the .NET framework. You can off course extend the class with Drag-and-drop support. That would really complete it. I might do it myself in the near future. Check this site for updates. The CreateProperty macro is simple Visual Studio.Net (Final) macro which can be used to generate the code for a 'private Field and a public Property Get/Set method'. 5. Select the (unzipped) 'ReflectionIT.vsmacros' file and select 'Open'. 6. Open a CodeWindow and add a public, private or protected field.